Making straight cuts in plywood is super easy when you have a straight edge to guide your saw. There’s no need to buy an expensive guide when you can easily make your own. Let me show you how I made mine. A transcript and screenshots are below the video. First, let me share the names of what I’m calling the parts of this assembly. The big board on the bottom is the base board. The skinny one on the top is the guide board. The first thing to consider is the thickness of your wood. 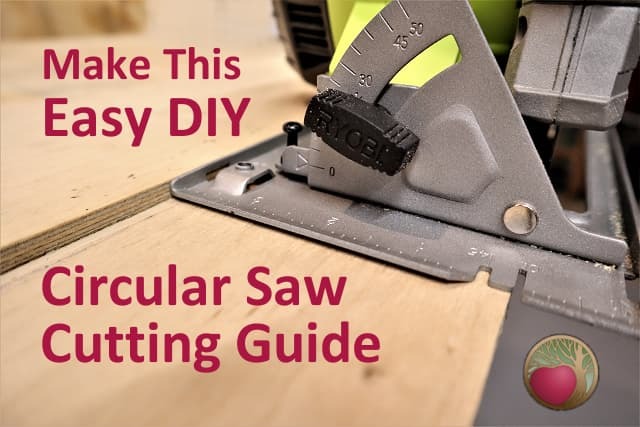 It needs to be based on the size of your circular saw blade and the depth of the wood you’ll be cutting when you use the guide. The thicker the stock you use for a base board, the less cutting depth you’ll have for the saw. 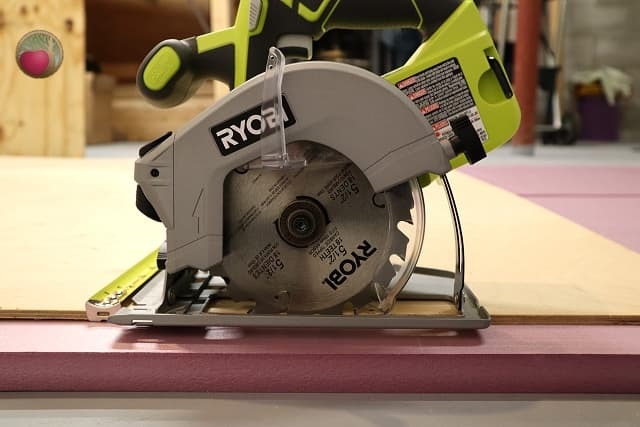 For my 5 1/2” Ryobi circular saw, I chose to use 1/4” plywood for both boards. That means my guide will be a bit flexible compared to thicker wood, but the glue up makes it sturdy enough. And the max depth my saw can cut is a 2×4, which is actually 1 1/2″. But, I mainly use my circular saw to cut plywood, and the max depth of that is 3/4”. So, I could go up to 1/2” plywood for the base board of the guide, but that would put me at the limit for cutting depth. 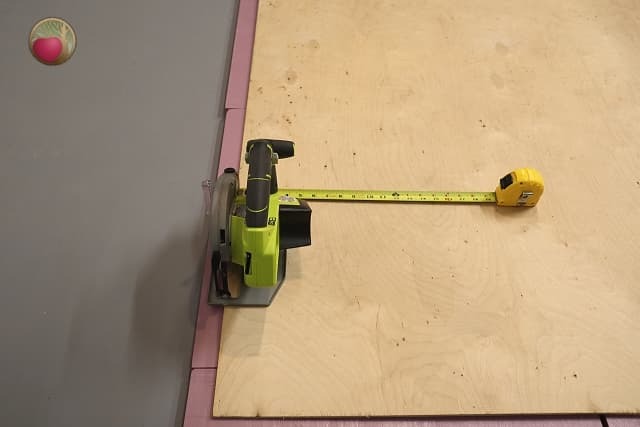 If you have a 7 1/2” saw, you can definitely use 1/2″ plywood for your base board. I used 1/4″ plywood for my guide too. The saw’s shoe that will ride against the guide is only 1/4” tall too. And I keep both hands down on the saw, so this suits me. If you feel you need a taller guide, then by all means use a thicker board. Next, you’ll want to measure your saw’s shoe, or base plate. Be sure your saw is unplugged or the battery is out before you do this part. Set the widest part of the plate on some plywood where the edge is free, meaning the blade tips are below the wood, as if you are cutting it. Lift the blade guard so that you can place the inside of the blade snuggly against the edge of the plywood. 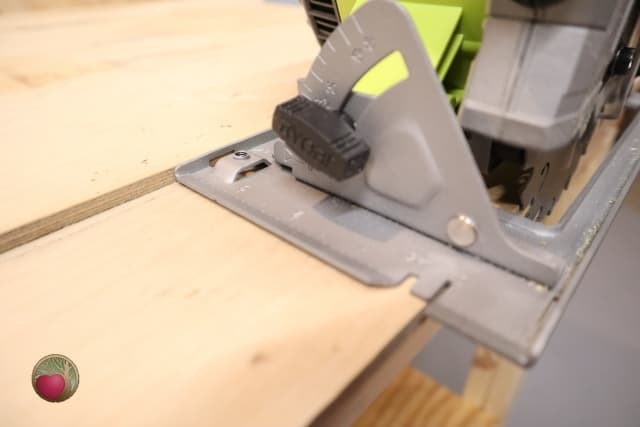 While holding the saw to ensure it is dead flat on the plywood, measure along the top of the shoe from the edge of the plywood to the outer edge of the shoe. As you can see, mine is 4”. Write down this measurement, you’ll need it later. And all other measurements of the straight edge will be in reference to it. For the next set of steps, it will be helpful to see both cuts. Here we’ll determine full width of both boards. You’ll want to make the guide board at least 3” wide. And then you’ll need at least another 3” on the base board, on the opposite side of the guide board, for clamping the assembly to the material to be cut. So, when you include the saw shoe at 4”, that will make the whole base board at least 10” wide (4” + 3” + 3”). But, you’ll want to figure it in about 1/2” longer on the baseboard so you have some board to shave off the edge later. Don’t cut this board yet!!! Just write down your measurement. Now you can have both of these cuts done for you at your home center, but if you have another sheet of plywood laying around that still has a straight factory edge on it, or another long straight edge, you can use that. First we’re going to cut the guide board. This is the narrower board mounted on top that will serve as the straight guide for the saw. Mark the factory edge of your plywood. This edge will serve as the master straight edge. 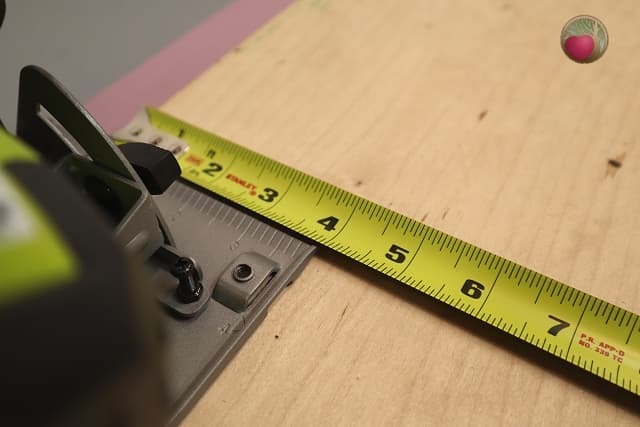 Measure in 3” (or how ever wide you decided to make your straight edge guide board) and mark it at both ends, and maybe even in the middle, if you are creating a long straight edge. Lay another sheet of plywood on top of the one you are cutting, with the factory edge on the 2nd line you just marked. This top plywood will serve as your straight edge for this first cut. Set your new guide board aside for now. This is the larger board on the bottom. Measure 10 1/2” (or however wide you want your base board to be). Mark at both ends, and maybe in the middle if it is a long. You can either use the guide board you just made, or the other sheet of plywood you used previously, and lay the factory edge on the second line. Lay the guide board on top of the base board. Ensure the ends are square. You should have 3” of base board on the other side of your guide board. Mark a line on the base board using the edge of your guide board as a reference so you can put it back in the same place. Remove the guide board and spread wood glue on its underside. Replace the guide board on top of the base board with the factory edge square on the reference line you drew. Use clamps or place heavy objects on the assembly. Wait 24 hours for the glue to fully dry. If you used 3/4” wood, you may want to brad nail them together. But for 1/4” ply, the glue should be sufficient. Clamp the assembly on a flat surface so that about 1” of the base board, on the side that will be trimmed, is hanging over the edge and free to be cut. Make sure you are on the 4 1/2” side. Place the long side of your circular saw shoe against the factory edge of the guide board. Cut the excess off the base board. (Should be 1/2”). 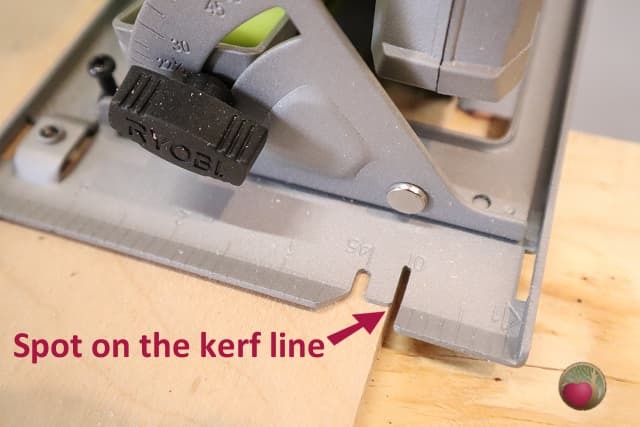 Now the edge of your baseboard is exactly 4” (or the width of your saw shoe) from the factory edge of your guide board down the entire length. 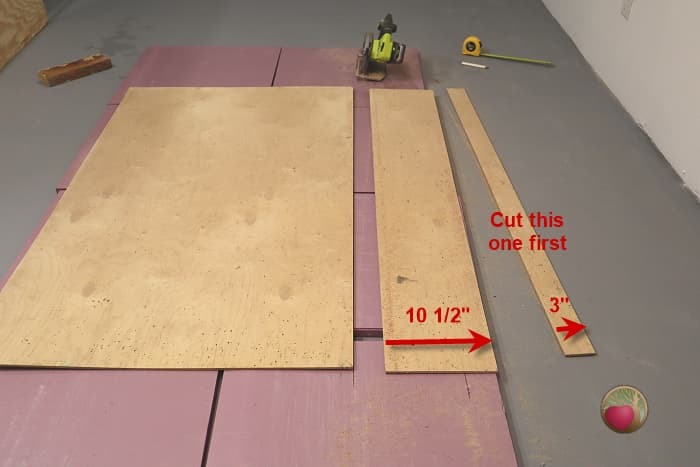 This method ensures that even if you didn’t glue your guide board perfectly square to the base board, the edges of both are perfectly parallel and you’ll always make straight cuts with it. Since the base board is about the same width on each side of the guide board, consider marking the side where your saw shoe will rest. I even marked a few arrows on that side, in the direction I’ll be cutting to help me remember. You should always lay your straight edge flat so that it never bows. That is especially true if you used 1/4” plywood, as it is more flexible. You could also drill a hole through one end, about 1” down from the edge, and through both boards, and hang the assembly on a hook. I hope you’ve enjoy this tutorial on how to make a circular saw guide. Be sure to subscribe to the Heartwood Art YouTube channel and get on my email list so you never miss handy woodworking tips and DIY projects just like this.